Women physicians now comprise 50 percent or more of most US medical school classes. Yet relatively few fill the most senior management positions within the healthcare system. 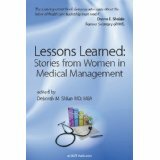 In "Lessons Learned: Stories from Women in Medical Management", editor and author, Deborah Shlian, MD, MBA profiles 24 exceptional female physicians who have defied the odds by rising to top management posts. They share their career paths from clinical medicine to leadership within government, academia, hospitals, provider groups, managed care, pharma, consulting and entrepreneurial ventures, including the obstacles and challenges faced in balancing work, family, and personal life. In the Overview chapter, Dr. Shlian explores the barriers women physicians continue to confront in seeking leadership roles. At a time when most agree that the US healthcare delivery system needs fundamental change, this book makes the case for talented women physician executives, articulate in the language of health care policy and business, to be among those leading the way. Deborah Shlian, MD, MBA is a physician and MBA with three decades of clinical, management, consulting, and physician executive recruiting experience. 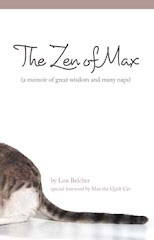 She has authored numerous articles, book chapters and two books related to health care management and careers in the industry. She has also written 5 award-winning medical mystery/ thrillers including "Rabbit in the Moon" which won the Florida Book Award. "These stories represent invaluable roadmaps for younger women who want to aim for the highest reaches in the health care industry. They show how these women have been on their own, working out individualized solutions to structural problems in rigid workplaces designed for traditional male breadwinners. They also point to the urgent need within the profession of medicine and the healthcare industry for career flexibility to enable the best and brightest, without penalty, to meet the demands of work and family.” Kathleen Christensen, Ph.D. , Alfred P. Sloan Foundation, Founder and Director of the Workplace, Workforce & Working Families Program and its National Workplace Flexibility Initiative.